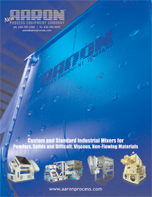 Aaron Process offers a complete line of Double arm Sigma Blade Mixers and Mixer Extruders, Plow Mixers, Ribbon Blenders and Laboratory mixers. All Aaron Process mixers are available in sizes from laboratory to production capacities. Loaded with value added design features as standard, all mixers and blenders are highly customizable. Or, select from a wide variety of available options.